When a bunch of strangers sit down to spend an afternoon together, certain topics of conversation are typically verboten — like politics and death. But for one group in Buffalo, the latter is the whole reason for gathering. Death Café Buffalo, the new, local affiliate of an international movement with chapters in 56 countries, is a discussion group where people get together, drink tea, eat cake, and discuss death. These open-door meet-ups exist to remove some of the taboo and macabre associations surrounding death, and to help people make the most of their (finite) lives. The underlying idea is that if everyone dies eventually, why not talk about it? Discussion topics vary based on the interests of attendees; there is no agenda, guest speakers or moderator. 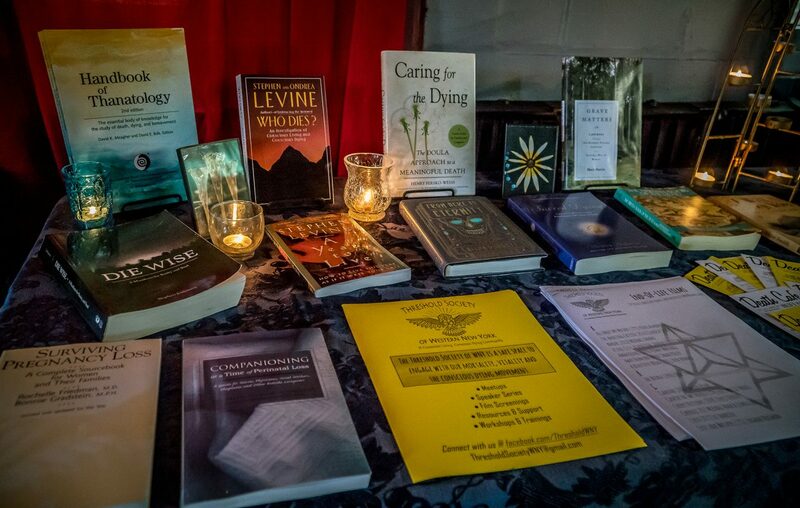 A recent gathering thoughtfully pondered the concept of a death midwife, a person who is brought in to provide comfort, support and advocacy as someone is dying. They talked about the pros and cons in the role of medication to manage pain while maintaining lucidity in hospice care, whether loved ones visit us after they’ve passed, how other cultures and belief systems mark the end of life, ideas for helping those nearing death leave a legacy, and the importance of communicating end-of-life wishes to those responsible for carrying them out. Rather than sadness, conversations are marked instead by intrigue, introspection, acceptance, enlightenment and peace. People of all ages and beliefs come to Death Cafés for healing, information, philosophical discussion, and just to listen. Death Café Buffalo holds gatherings roughly once a month in the calm, candle-lit back room of Sewing Souls Studios, a funky former house on Elmwood near Allen that’s now a maze of workshops bursting with fabric, costume projects, resistance art and energy. Admission is a suggested donation of $5 and a dish to pass; attendance is limited to 25 people to keep the atmosphere intimate. Cake and tea are provided. For dates and locations of upcoming meetings, visit Facebook.com/DeathCafeBuffalo and learn more at Deathcafe.com.